A new audio drama is set to start this month, bringing a host of expat actors together with international performers in a nine-part podcast about criminals trying to take over the Internet. 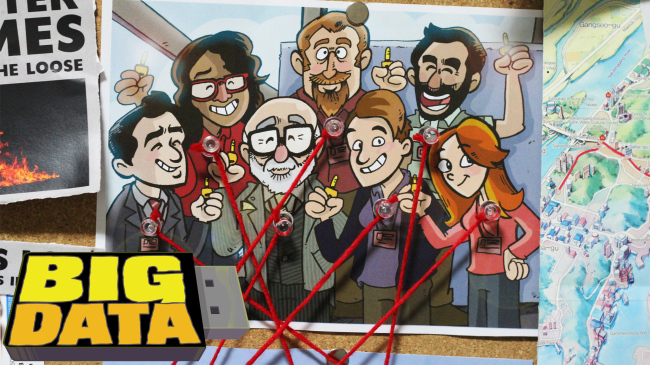 “Big Data,” which features guest spots from the likes of Jemaine Clement (Flight of the Conchords), Paul F. Tompkins (Mr. Show), and Amy Stoch (Bill And Ted’s Excellent Adventure), is the brainchild of Busan writer Ryan Estrada. The podcast was inspired by ceremonies run by U.S. company Icann as part of efforts to protect the Internet’s Domain Name System, which matches website names to IP addresses. In the ceremonies, seven dedicated key holders -- chosen partly for their geographical distribution around the world -- meet and use their keys to confirm the DNS registries. “I remember reading an article about that and thinking I can’t believe no one had ever made a movie or a TV show about that,” he said. Estrada said that audio was the perfect format for dealing with the subject. But there was another benefit of radio. Estrada’s main job is as an author writing prose and comics, with his work taken up by publishers such as Random House and Hatchette. But instead of writing for a year and then spending another year illustrating, he has been able to work with a cast who brought their own ideas and takes on the story. “It’s become something very different than if I was doing it alone, so I’ve really enjoyed seeing all these different things people have to make it more interesting,” said Estrada. He recruited members of acting groups in the south of the peninsula, such as the Busan English Theatre Association, Shakespeare in Busan, The Ha Ha Hole, Ulsan Industrial Theatre Troupe and The Gwangju Performance Project to provide the voices and the large number of actors needed because the format introduces new characters in each episode. “It’s kind of like when you watch an old show like the Twilight Zone where each show has its own set of characters. I wanted to make it like that where you never know what to expect,” Estrada said. The storylines vary too -- from a closed-room thriller with three people trapped together, to a musical. What they have in common is that all feature someone trying to steal a key. Estrada says the studio recording work is complete and he only has post-production work and some guest spots to fill. But he is pleased by the guest actors he has managed to bring in. “I am a big fan of Paul F Tompkins, I know people in Korea maybe don’t know him as much, but he’s worked with so many big names. He’s been in Oscar-winning movies. He’s been in Disney movies and I’m a big fan of his work,” he said. And its that international audience and international collaboration that makes the work of those seven keys so special. The series is set to run starting May 21, but there will be a wrap party on Saturday at HQ Kyungsung in Busan from 7 p.m. with music and clips from the show and live performances. The show will continue crowdfunding at bigdata.show until the first podcast is available, but there might be one unsettling omen: By Estrada’s calculations, it is quite possible that the project will have 404 backers.